- Aux. light bar for mounting Front lights/ GoPro etc. - Windshield adjustable screen mount: Keeping your gear Clean and Air flowing around you-- rather than on. - Skid plate & Heavy Duty Starter Motor: Keeping your lil'baby safe. - Cush driven rear wheel set: Great for smoother street riding. - Carbon Fiber Brush/Hand guards: Protection, Warmth & Style. - Full luggage set including the Tough bag kit c/w First aid kit: Quick Detach, Lots of storage, Lots of pockets & Waterproof Zippers. - BMW Motor: <-- Very Hard to find w/ BMW parts. 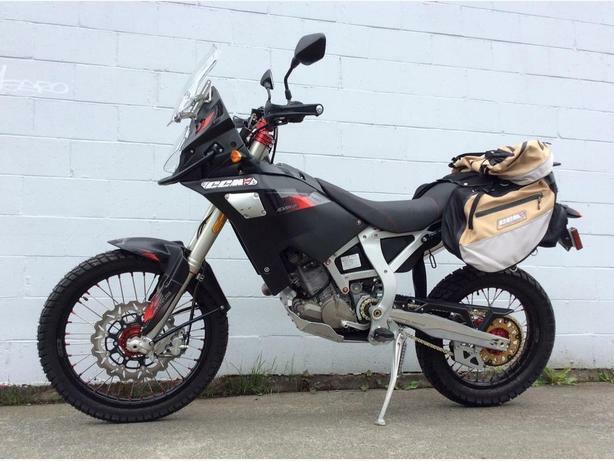 CCM Adventure S-Model 450cc: Ready for the adventurer in you! CCM - Clews Competition Motorcycles - is celebrating an incredible 45 years in business this year!